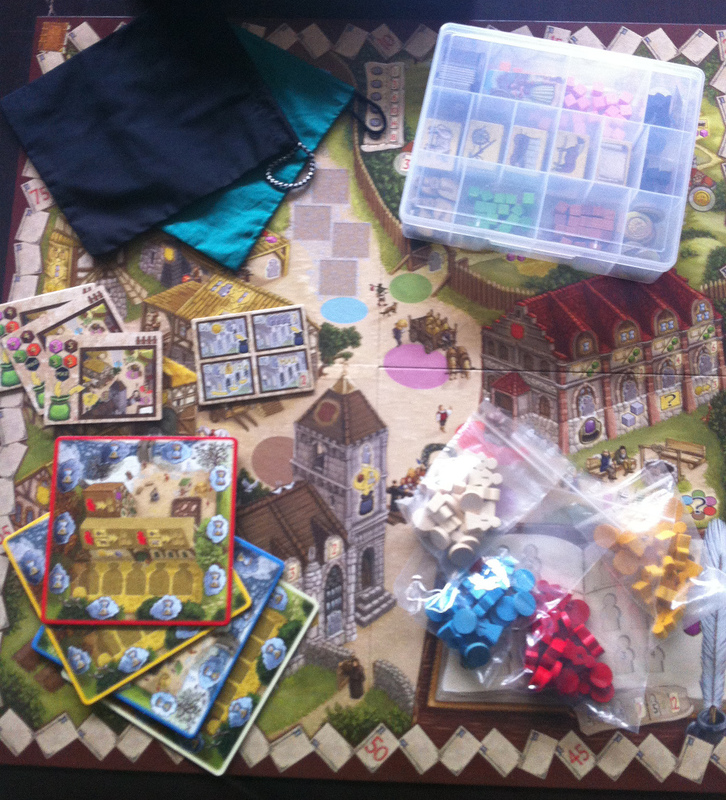 Designed by Inka & Markus Brand, art by Dennis Lohausen, English edition published by Tasty Minstrel Games. 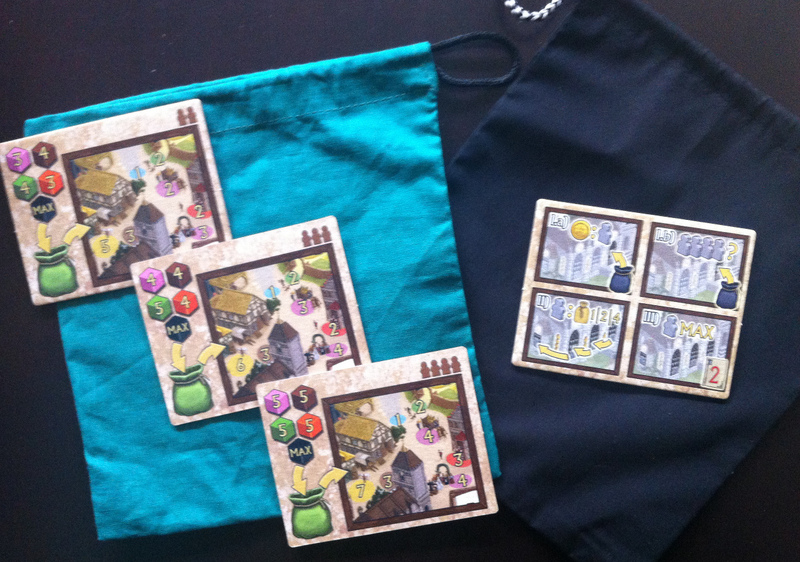 It is an action drafting game about managing your family’s life in a mid-sized village. 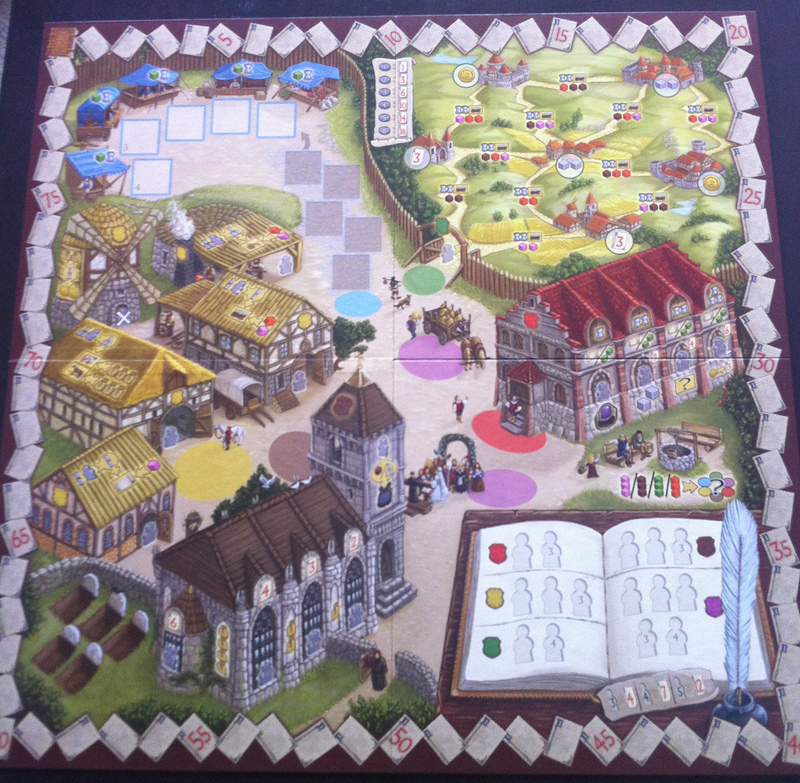 Though the theme might sound boring, it is a very elegant and effective board game that highlights different aspects of life in a European village. Your family will farm, become craftsmen, become influential members of the church and/or village council, sell wares at the market or even travel to different villages and towns. In the end, the legacy left behind by your family members through their works will determine which family is the most prestigious in your Village. Village is one of my favourite games that I’ve played in the past year. It is unashamedly “Euro” in design. The core actions are taken using a drafting mechanic, where you take turns taking resource cubes from spaces linked to specific actions. When you take the resource, you can also execute the action associated with the space (except the Market, which is mandatory). The number of cubes in each space are different so the number of available chances at each action are different. It also depends on the number of players, which determines how many cubes are in the bag and how many cubes are pulled out and spread across all the action spaces. I really like this simple and effective twist on the action drafting mechanic, as you have two vectors influencing your decision: the resource you get and the action you get to take. A further complication is the addition of the black “disease” cubes which are not resources per se, but require you to lose “time”. The implementation of time in the game is one of the really interesting mechanics in this game. 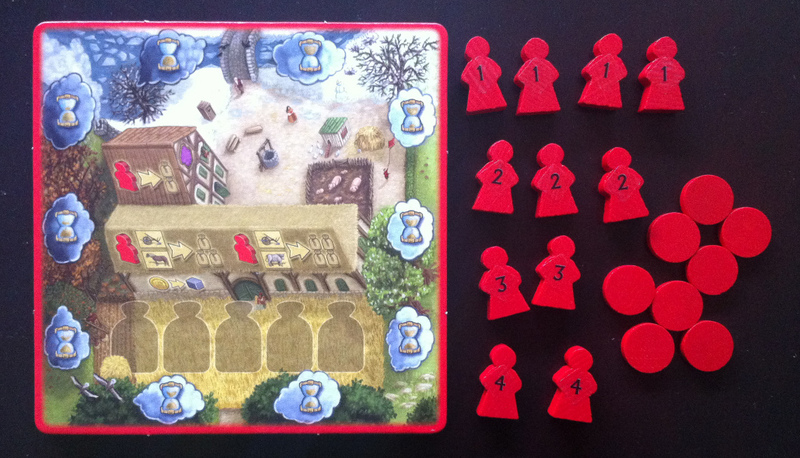 You also have family member pieces which you can send out onto the board when you take actions and they mark your stake in a particular action space and some actions require a family member to execute them. There is also a “time” mechanic. Some actions cost “time” which is represented by moving a marker on a track on your personal board. As more “time” passes, the marker loops around and when that happens, one of your “oldest” family member “dies” and is removed from the board to be either enshrined in the Village Chronicle as an esteemed former occupant or buried in the graveyard. The family member pieces are marked with numbers and you can get additional “younger” family members to supplement your aging family. You start with the family members marked “1” and you get higher numbered family members through the family growth action. Whenever your time marker loops around, you have to remove one of your lowest numbered family members from either the main board or your personal board. Depending on where that family member was, it will occupy different spaces in the Village Chronicle or in the graveyard. You get additional points at the end of the game if you have a certain number of family members in the Village Chronicle. The dead family members also function as a game timer, as the game ends when either the Village Chronicle or the graveyard is full. I really like how all the mechanics work together and reinforces the simple theme of life in a village. You gain points for advancing in the village council, in the church, selling at the market, or traveling to other villages. Everything just seems to click together really well and there are always lots of significant choices to be made. I like that you have various ways of getting points and in our few games we’ve had each player focusing on slightly different strategies. Although most of the mechanics in the game or nothing new, there’s an elegance to how each mechanic ties into each other, especially through the passage of time. It’s also amusing sometimes when you’re racing against other players to kill off your family members to take the last related spot on the Village Chronicle. The production is also very well done, which is always nice. 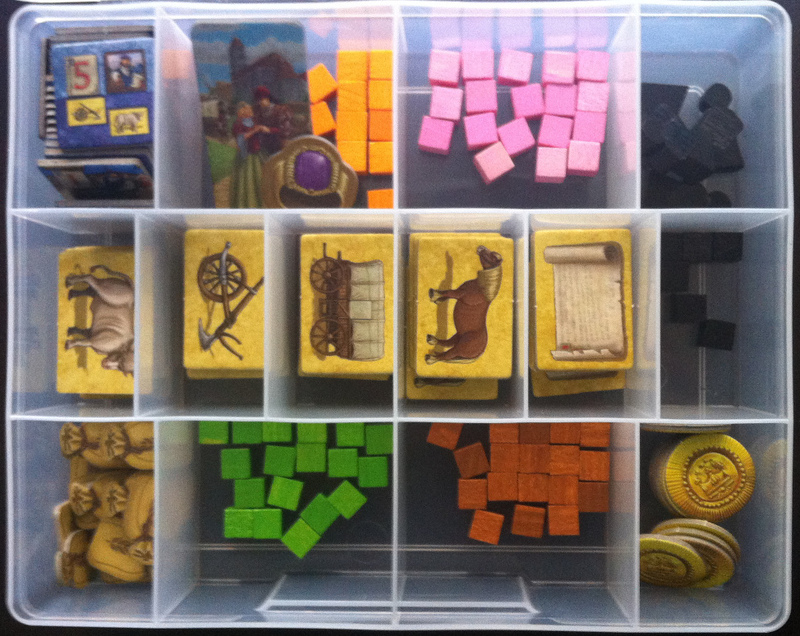 Everything is clearly and elegantly laid out with just the right amount of visual trim to keep things interesting while not overcrowding the design (*cough*FantasyFlight*cough*). Another thing I like is that every point is transparent. The points you get from the market, the chronicle, influencing the church and council, and traveling are all clearly stated on the board. The drawback to that is that it can lead to some analysis paralysis in the later rounds, but that can vary depending on the group playing. 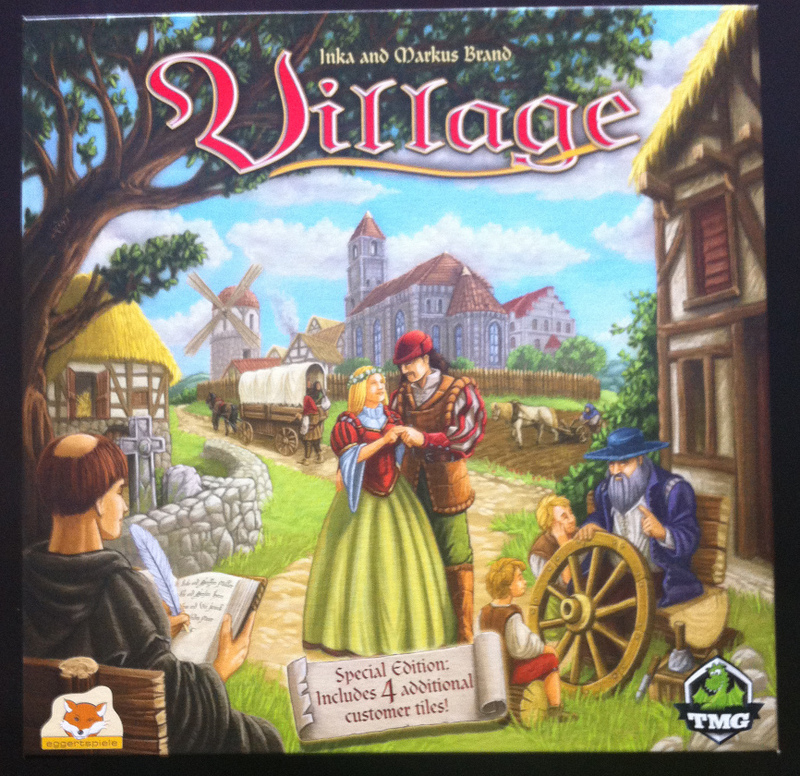 Overall, I highly recommend Village. If you’re a fan of Eurogames, definitely give this one a shot. 5 out of 5 Wooden Carts!